The following is the third of five segments tying together the loose ends of a fantastic load of misinformation, propaganda, media hype and revisionist history surrounding what is now being erroneously dubbed the worst war effort in the 229 years of this republic. This week we dissect the White House’s recent launching of a 35-page ultra-spin document called the “National Strategy for Victory in Iraq” and what it means for the future of this country’s involvement in rebuilding Iraq and the rapid crippling of the Bush presidency. With record lows in approval ratings from the public and a less than a 50% vote of confidence on the progress of the war, the administration was forced to come clean with some kind of explanation for things. Of course, this and two bucks will get you a ride on the subway, other than that its white noise and pabulum. It’s kind of like those college term papers you whipped together in the final desperate hours of caffeine and No-Doze abuse when you had nine months to complete it in the first place. But they went through the trouble of thrashing it together, so we might as well respectfully mock it. Let’s begin with what the White House has dubbed its Three-Track Strategy: Political, Security, and Economic. Political means building an Iraqi government, the first portion of which is the badly formed, but relatively successful constitution and two blood-soaked elections. Guess what? There’s another on the way! Unfortunately for those in charge, assassinations, protests, and the odd car bombing aside there are three extremely divergent cultural and racial groups that are far from being on the same page. More to the point, the chasm of hatred is entrenched, and has been for decades. Therefore the present government represents nothing. How this administration plans on dealing with this, if at all, is hard to say. Our fingerprints appearing on the new Iraqi power structure reeks of puppet leadership and may well add to the heightened levels of anti-American sentiment in a region already spiked in the red. It’s kind of like those college term papers you whipped together in the final desperate hours of caffeine and No-Doze abuse when you had nine months to complete it in the first place. Security is a biggie. While being dumbfounded on the political front, The “National Strategy for Victory in Iraq” makes a few inroads to explaining the emergence of an Iraqi Defense Force, including police. However, the numbers are skewed. And that’s being kind. Unkind would be to say they were made up. Bush heralded this nonsense by telling the nation and the world that the present Iraq Army is comprised of 120 battalions, which means 42 to 96 thousand troops. This projection flies in the face of Pentagon estimates of some 200,000 troops last summer. And anyone with half a brain and any memory knows the Pentagon is onerously optimistic about these things. That’s kind. Unkind is to say they lie a lot. Then there are the generals on the ground, at least those who haven’t been sacked for suggesting more troops, who have unanimously estimated only 30% of the president’s 120 battalions can barely be expected to back-up our army in maneuvers like the recent Talafar operation Captain Shoo-Inn broached in his fancy naval speech. 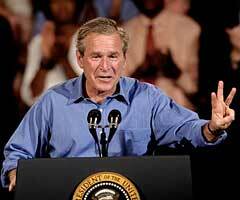 Bush announced Iraqi troops were prominent there. The US Army disagrees, unless a few clean-up militia types constitutes prominent, and it does not. More than one general is on record as only admitting to one battalion. Count it: one battalion ready to defend its post. One out of 120 is not even an acceptable percentage for the most dutifully sanguine among the president’s supporters. Another key element of the security issue is a police force, which now appears to merely be a rogue collection of Shiite militias torturing and killing Suni citizens by the truckload. And what about the Iraqi Air Force so vaguely discussed in the handy plan booklet? Roughly two-dozen planes donated by America and manned by American fighter pilots does not an Iraqi Air Force make. Again, that would be kind. An unkind assessment would be that Iraq has no Air Force. Economic? Let’s face it folks, according to any independent projection you’d like to Google the present infrastructure of Iraq makes it virtually impossible to accurately count on any financial solvency. Plainly, it’s in big trouble and not likely to get any better. The whole “controlling the Iraq oil fields to rebuild” idea has more or less gone bye-bye. Without oil Iraq is a useless pile of sand with murderers a-plenty. Not a key demographic for industry or anything else beyond booming weapons sales. Good news is that history tells us leaving countries for dead actually projects better economically than stuffing them full of Pollyanna. Look at Germany and Japan, both left in post-war ruins with no prospects of open enterprise and growth. They are now (after half a century, mind you) counted as the two most prominent economic powers in the world. Far better than what we’ve got going here, and neither are involved in wars and in massive debt to evil communist regimes or run by neo-con goofballs with little to no plan on how to fix things, beyond error-laden book reports and tap-dancing speeches. Hope your grandchildren can avoid the draft. That’s a kind prognostication. Unkind would be, invest in pine box futures.